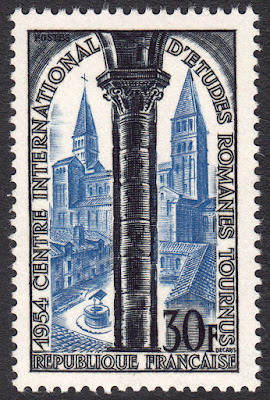 Created in 1953, the International Centre for Romance Studies (Le Centre International d'Etudes Romanes) is located in Tournus, Burgundy, France. It is commonly known by the acronym CIER. The aim of the centre is to promote the study of Romanesque Art through exhibitions, study tours, and conferences and other activities. 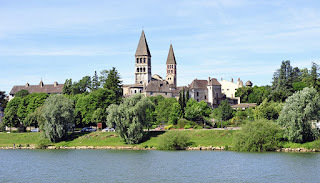 It is also dedicated to the preservation of the local monuments of Tournus, such as the Abbey of Saint Philibert, and the St. Lawrence church. 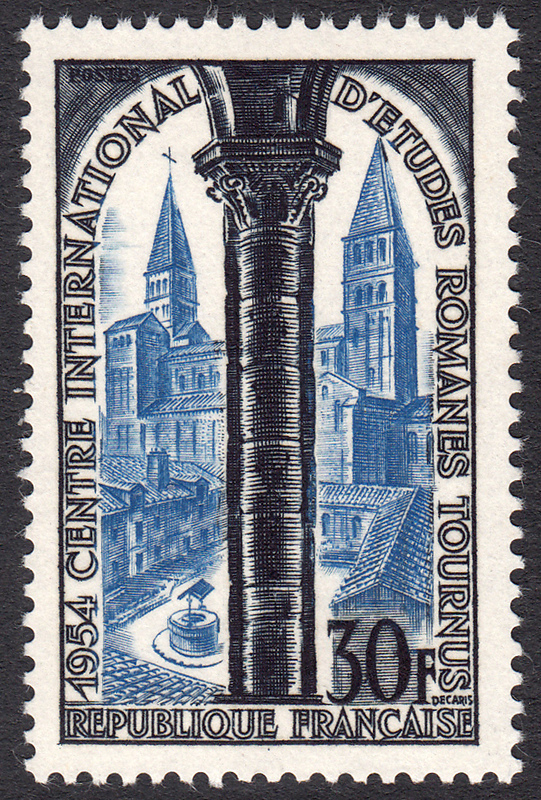 On 20 June 1954, France issued a stamp to commemorate the establishment of the CIER. The stamp has a value of 30f. It was designed and engraved by Albert Decaris. This stamp is beautifully designed. It features a Romanesque column in the foreground, while in the background stands the lovely Abbey of Saint Philibert. This striking church was once a Benedictine Abbey. It was founded in 875 by Benedictine monks who were fleeing Viking raids on the community on Noirmoutier. They carried with them holy relics of Saint Philibert of Jumièges.. The building that survives today was designed in the Romanesque style of Burgundy.